This is the first blog in our New Energy Opportunities series that explores leading edge clean technologies that could revolutionize the way we buy and sell energy. Read more about renewable energy for business here. Asking “What is blockchain?” is like asking “What is the internet?”— depending on who poses the question, the answer could mean absolutely nothing or literally everything. From a 10,000-foot view, blockchain technology is a distributed, digital ledger used to record and track transactions. It uses sophisticated algorithms to validate, encrypt, and instantaneously record transactions for virtually anything of value in a secure and decentralized manner. While most well known as the technology underpinning Bitcoin virtual currency, blockchain has the potential to be used in many different industries and contexts due to the high degree of transnational efficiency it provides. Today’s new energy opportunities focus more on distributed energy resources (DERs), such as wind turbines and rooftop solar, where producing-consumers or “prosumers” occupy a newfound position in the grid value chain. Distributed technologies collectively shift the industry towards greater decentralization. However, these new energy opportunities often struggle to gain a foothold in a system that was not designed with them in mind. For the industry to realize the full potential of renewables and other emerging clean technologies, we must re-envision the grid as a transformative tool that enables prosumers of distributed energy. Currently, renewable energy generation is tracked using energy attribute certificates (EACs) and information sharing among market participants is a manual process. To date, this process has worked due to the closed, controlled nature of energy markets. However, as new technologies come online, markets become more complex, the prices of DERs fall, and energy markets open to smaller-sized market participants, tracking the generation and ownership of EACs becomes much more difficult. With blockchain, EACs can be created instantaneously as renewable energy is put onto the grid — no matter the size or physical location of the producer. This immediate production of the certificate creates a verifiable chain of custody for renewable energy attributes and helps ensure clean energy producers receive credit for the energy they generate while prohibiting the double-counting of energy attributes, among other functions. The recent Brooklyn Microgrid project is a good example of blockchain’s potential to create efficiencies in electricity trading. This microgrid uses blockchain to cut out third parties (such as a local utility) and empowers rooftop solar customers to sell excess power to their neighbors directly. This groundbreaking peer-to-peer network provides increased control to consumers; and by decentralizing power supply, also insulates customers from price volatility and supply disruptions in broader energy markets. Companies exploring clean technologies to meet sustainability and financial goals often find that traditional energy markets restrict their efforts. With the increased autonomy that blockchain introduces, corporate energy buyers may find it easier to accomplish these goals — and at a lower cost and time commitment. 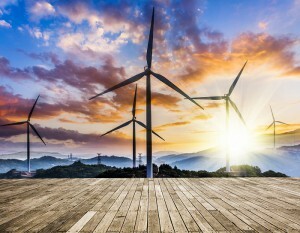 While the diversity of blockchain applications and timing of deployment is unknown at this time, this disruptive technology is sure to make waves in the energy industry in future years. For corporate energy buyers, staying in front of viable new energy opportunities, including blockchain, can be a daunting task. The NEO Network™ is home to the largest database of cleantech intelligence and puts actionable opportunities at your fingertips as they become available. For more information on the NEO Network can set your company ahead of peers and competitors, get in touch with our team today.